Tickets: £12 for adults; (£15 on the day) £6 for children over 6. Book HERE. 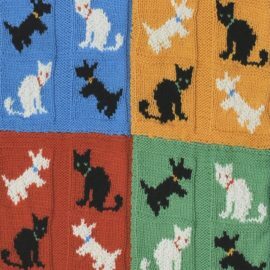 Exhibitors: Over 40 exhibitors, carefully chosen to offer a wide range of all things Knitterly (and Crochet-y), Card Aid shop. Lots of unusual Christmas presents. Pop-up Museum Shop and café. Tickets £45 per course. Book HERE. Kit for the Secret Garden jacket. Will be launched at the Knitfest. Sasha Kagan’s specially designed blanket. 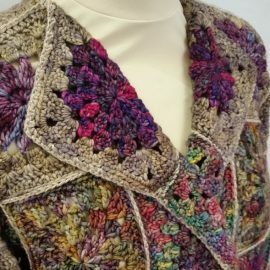 Kits will be available at Knitfest. 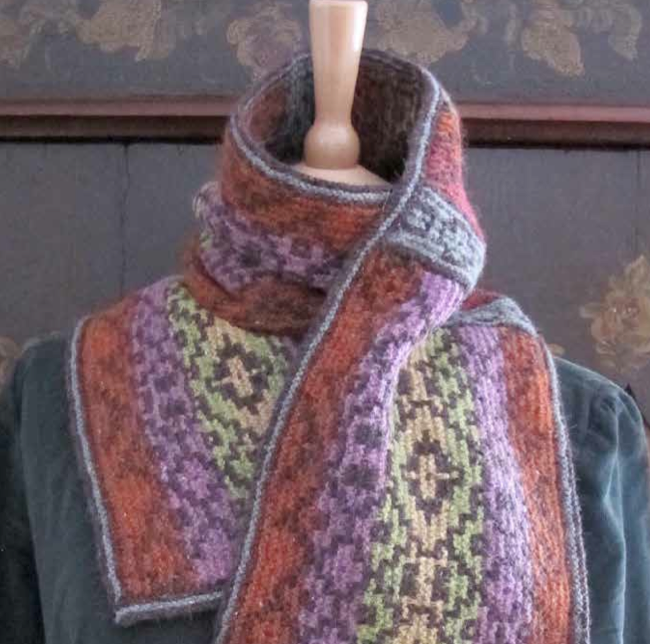 Marie Wallin’s scarf design from the Warm and Woolly for Winter Booklet. Learn to Knit: Patient experienced teachers will show how to cast on, cast off and knit plain and pearl stitches. Tickets are £25 (adult) and £15 (child 8-15). Book HERE. 1 hour session hourly from 10:30am until 5:30pm. Regretfully Susan Crawford has had to withdraw. Tickets are free with entry to the KnitFest. Pre-booking is advised. Book HERE. Note: On-street parking on Sunday. A complete digital booklet of patterns for scarves and some gloves. 8 fabulous designs by 7 fantastic designers. 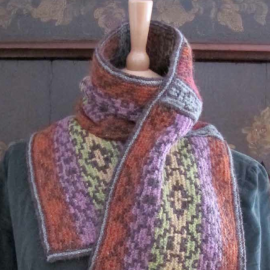 Proceeds from the sale of these patterns will support the distribution of warm knitting donated by generous knitters to needy people in the UK and abroad. Why not make them in time for the Knitfest on November 5, and come and show them off? £3 per separate design – click on any image below to purchase. Combine a visit to the Edinburgh Yarn Festival with a chance to visit Edinburgh and its surroundings. Non-knitters welcome! 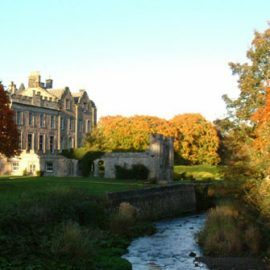 Newbattle Abbey was founded as a Cistercian Monastery in 1140, with the Reformation it became the ancestral home of the Lothian family. 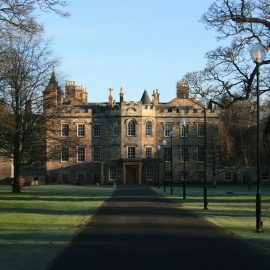 In 1937, the Marquis of Lothian gave Newbattle Abbey to the nation to be used as an educational establishment. It’s now a training college for mature students. Set in 125 acres of park land, both the building and its grounds are listed as items of outstanding architectural and archaeological importance and the reception rooms (in which we’ll be holding some of our evening meetings) have been described as the most beautiful in Scotland. The crypt where we’ll be knitting! 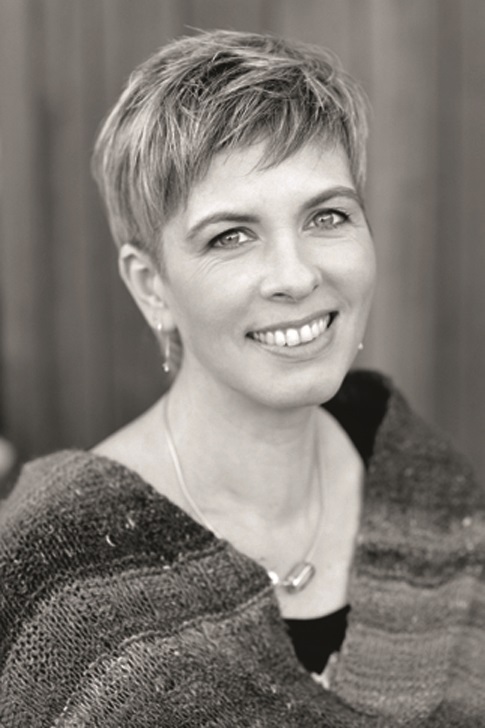 Juliet Bernard will be joining us and promises to lead our scratch choir singing Scottish balads. She’ll also be available to share her knitting hints! 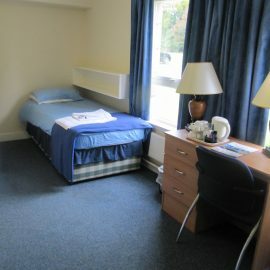 Bedrooms are basic but clean, with ensuite facilities and tea and coffee making equipment in the rooms. Nearby attractions include a whiskey distillery, the Mining Museum Scotland and the Rosslyn Chapel. 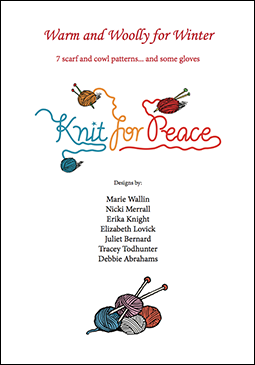 Cost is £595 which includes a £100 donation to Knit for Peace. 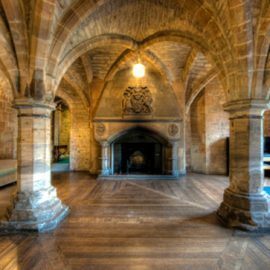 By holding our event at Newbattle Abbey, we’re supporting the work of this charitable institution. This price includes three nights bed and breakfast (arriving on the 14th and departing the morning of the 17th), access to the grounds, the historic buildings, and evening events. We will also be organising optional visits to New Lanark, and to projects supported by the Charities Advisory Trust, our parent charity. In partnership with our sister charity Card Aid, we have a stunning new range of Christmas cards for 2017, all to help raise money for Knit for Peace’s distribution costs. To purchase any of the designs, CLICK HERE. Or if you’d like to see cards for a range of causes, please visit Card Aid’s site HERE. As the cold weather creeps in, we are getting more and more requests for knitting. Just for the moment, please don’t send in any more squares that need making into blankets or dressing gowns because we can’t keep up with the inflow.